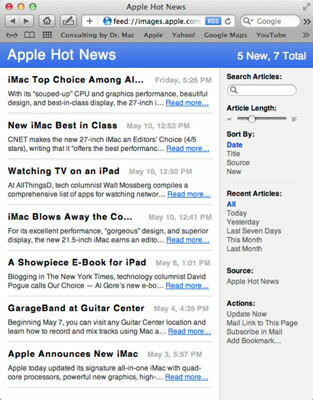 If you’re interested in closely following a certain kind of news from a specific website with Safari in Mac OS X Lion, you’ll be happy to learn about RSS feeds. In the past few years, blogs (short for web logs) have cropped up all over the web — whether as online personal journals or corporate sources of business information. Look for an RSS icon. When a web page is associated with an RSS feed, a little RSS icon appears at the right end of the address bar. Click the RSS icon to see all the RSS synopses for the site. The right side of the window gives you control over what you see and how it’s displayed. You can search the articles by typing a word or phrase. You can drag the article-length slider to see more or less of each synopsis. Or you can click other items — Sort By, Recent Articles, Source, or Actions — to sort or filter the articles, display the page that this RSS feed represents, update the contents of this page, mail a link to this page to someone, or subscribe to this feed in Mail. You can, of course, bookmark an RSS feed just as you would bookmark any web page. But if you really like a feed, you might want to subscribe to it in Mail, which shows you the updated contents of the feed in the Mail application. Click it again, and the RSS synopses disappear. They’re replaced by the page contents.